Combine all the ingredients in a bowl and knead into a soft dough using enough warm water.Keep it aside covered with a wet muslin cloth for 10 to 15 minutes. Knead again using oil till it is smooth and divide it into 10 equal portions. Roll out each portion into small rotis using a little flour for rolling. 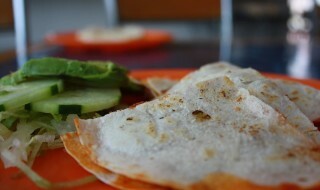 Cook each tortilla, lightly on a tava (griddle) and keep aside. Divide the stuffing into 5 equal portions and keep them aside. Place a tortilla on a clean, dry surface and spread a portion of the stuffing evenly over it. Place another tortilla over it and press it lightly. Repeat the same with the remaining tortillas and stuffing to make 4 more quesadillas. Just before serving, cook each quesadilla on a tava (griddle) using 1⁄2 tsp of oil till pink spots appear on both the sides. Cut into equal pieces and serve hot.